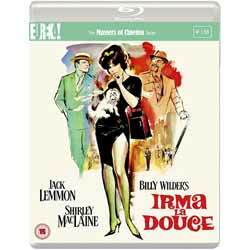 Irma La Douce is the last great Billy Wilder film that was a smash box-office success. It’s followed by seven pictures, only one of which, The Fortune Cookie (1965), made money. The others, Kiss Me Stupid, The Private Life of Sherlock Holmes, Avanti, The Front Page, Fedora and Buddy Buddy either did token business or cratered dismally. Let it be said though, that a Wilder failure, like a Hitchcock ‘failure’ is still a watchable delight compared to many of the vapo successes in the same era – which today, are torture to watch – movies that could be used on inmates at GITMO when the Geneva Convention wasn’t watching. No Wilder picture is that bad and some of his ‘failures’ have belly laugh potential moments that stand the test of time as well as unsentimental pathos that evokes tears. In the rich Eureka treasure of extras, (1080p, superb print) film scholar Neil Sinyard quotes Wilder as finding fault with the film, as a hybridization of Tennessee Williams and Disney but being consoled that the movie earned over $25 million (substantive money in those days) in its first run extending all the way through 1964. Wilder can be consoled for that reason but his conceptual pride wished for more. He was only in competition with himself but still driven by his own gimlet eye for perfection. The film is 147 minutes long and plays like something running way under two hours. It’s packed with eye candy: colour, set design detail, texture, fast pace, kinetic body comedy, character, funny dialogue, narrative irony and edgy vulgarity. This latter component is a Wilder speciality, never going too far but further than lecherous Hollywood could confidently venture without being cheesy and sophomoric. He would be criticized for this by harridan film critic Pauline Kael but he never lost sleep over it. Irma La Douce’s Parisian set was the wonder of Hollywood: multiple storied walk-in buildings, dramady through the windows, a working street with vehicles and pedestrians coursing by. Hollywood denizens came to walk through the set in awe. Teeming with background life all attended to meticulously. Every character has a life and the whole virtual space is a cornucopia of delight. A recurring motif in Wilder films is the hero’s disguise for a purpose of love. Jack Lemmon transforms into four characters for the sake of his love: Irma. Irma, you see, is a prostitute among a row of professionals including Wilder regular Joan Shawlee as Amazon Annie well as Tura Satana (who would go on to star in Russ Meyer’s classic Faster Pussycat, Kill, Kill ). Lemmon’s disguise as Lord X is his tool to keep Irma all to himself, which incurs night jobs – and the best body pratfall comedy in his career. Is it politically correct? No, and one can imagine Wilder casting off this concern with a German curse or two. For a person who lost all the women in his family to the death camps, morality is a farce. It's a one joke movie with arising gambits that continuously surprise, intrigue and charm. Re-viewing is rewarding. New details keep popping up. Shirley MacLaine’s exuberant dance atop a pool table is my favourite dance of her entire career and that’s saying something. It alone bears watching again and again. No spoilers here. I wouldn’t dare, except to say, love wins out.